NASA's Stardust spacecraft may be 209 million miles from Earth when it snuggles up to comet Tempel 1 tonight (Feb. 14), but that doesn't mean the rest of us will have to miss out. NASA is giving the public several ways to see the comet flyby online. First, a bit of cosmic scheduling info: The Stardust spacecraft will fly by comet Tempel 1 tonight at 11:37 p.m. EST (8:37 p.m. PST, 0437 Feb. 15 GMT). That's the time of closest approach, though cameras on Stardust have already been able to spot comet Tempel 1. 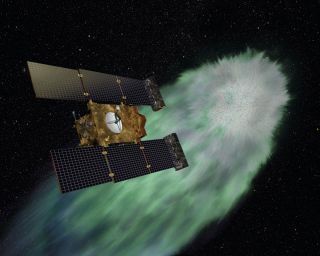 The flyby is part of NASA's Stardust-NExT flight, which extended the Stardust probe's original mission after it visited the comet Wild 2 in 2004. NASA will broadcast the flyby live on NASA TV starting at 11:30 p.m. EST. If you don't get NASA TV on your televisions at home, you can watch the webcast here: here: http://www.nasa.gov/ntv. NASA's flyby broadcast will run from 11:30 p.m. to 1 a.m. EST. "Live NASA TV commentary begins from mission control; includes coverage of closest approach and the re-establishment of contact with the spacecraft following the encounter," the space agency said in an announcement. You can also watch via NASA's Ustream channel operated by the agency's Jet Propulsion Laboratory (JPL) in Pasadena, Calif.: http://www.ustream.tv/user/NASAJPL2 . The space agency plans to take questions via the Ustream channel and offer real-time chat for the encounter. JPL serves as NASA's mission control for the Stardust-NExT mission. NASA also has a real-time animation tool that allows users to see a 3-D depiction of the comet Tempel 1 encounter as events unfold. The tool, called "Eyes on the Solar System" is available here: http://solarsystem.nasa.gov/eyes. While the time of closest approach is at 11:37 p.m. EST, NASA's first confirmation signals from the Stardust spacecraft at 11:56 p.m. EST (8:56 p.m. PST, 0456 Feb. 15 GMT). The first images should be beamed back to Earth over the next few hours. NASA officials said the agency will take a short break during this downtime, and then resume coverage to unveil the first five photos of comet Tempel 1 taken during the Stardust-NExT comet flyby. The comet photos broadcast will begin at about 3 a.m. EST (12 a.m. PST, 0800 GMT) and end at about 1 1/2 hours later, JPL officials said.